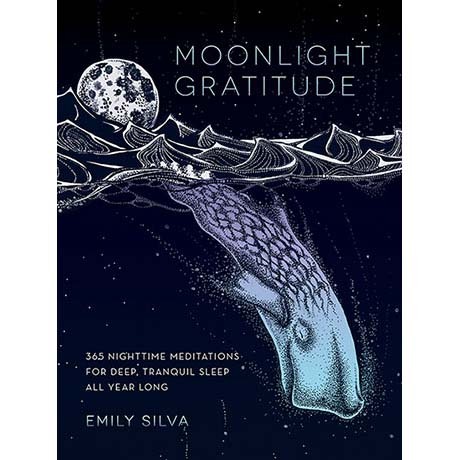 Get in the right mindset for sleep with Moonlight Gratitude, which features spiritual passages and words to guide you through a calming nighttime meditation. Enter into sleep peacefully with this book of relaxing meditations. Moonlight Gratitude provides spiritual passages and words, such the one below, that guide you through a calming nighttime meditation. As the moon casts its silvery glow across the water, the ocean moves and responds to its pull. The tides rise and fall with the cycles of the moon. Be like the ocean; fluid and forgiving. Wash away whatever is holding you back. Forgive others and let go of the pain. Release all bitterness. Allow your breath to become rhythmic like the waves upon the shore as you drift off into a peaceful slumber. Breathe in forgiveness, breathe out bitterness. Moonlight Gratitude is not a sleep exercise book. It instead increases your awareness and understanding of your mind at night so you can fall asleep with a peaceful, thoughtful mindset.